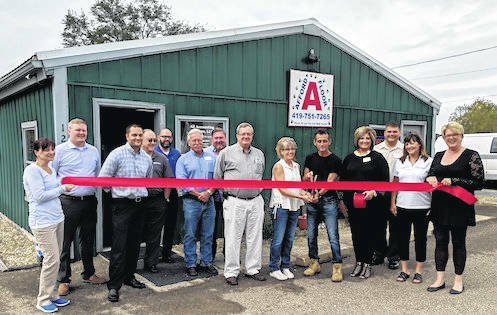 Celebrating the Grand Opening of Afford-A-Floor in Edison are Alicia and Harold Stuttler with the scissors, along with Chamber of Commerce members and county officials. EDISON — The Morrow County Chamber of Commerce Director, Shelley Planey welcomed Alicia and Harold Stuttler to their new location at 126 E. High St. The Stuttlers gave tours of their Afford-A-Floor business during their grand opening and ribbon cutting with Chamber of Commerce members and local residents. Visitors were introduced to flooring products from Gilford, Shaw, Raskin and many more companies. Harold said they have both commercial and residential flooring that includes carpet, vinyl, laminate, hardwood, vinyl planks and other types of flooring. They will be having both rolls and remnants in stock. They sell and install flooring with 31 years of experience in the business. Both Harold and Alicia operate Afford-A-Floor, LLC and Alicia has Affordable Accounting. Alicia is a CPA and a graduate of Franklin University. She has had more than 25 years accounting experience. Both businesses share the same building location. John Cook, the Stuttlers’ distributor for Gilford-Johnson flooring, came to the opening and is enthusiastic about working with the Stuttlers. He said he has known them from other stores and looks forward to bringing his company’s flooring to Morrow County. Hours for Afford-A-Floor are Tuesday-Friday from 9 a.m. to 5 p.m. and Saturday 9 a.m. to 1 p.m. and by appointment. The phone number is 419-751-7265.
https://www.morrowcountysentinel.com/wp-content/uploads/sites/29/2018/10/web1_IMG_20181002_110331.jpgCelebrating the Grand Opening of Afford-A-Floor in Edison are Alicia and Harold Stuttler with the scissors, along with Chamber of Commerce members and county officials.